Strong winds and dry air created dangerous fire conditions in parts of Utah on September 19, 2010. 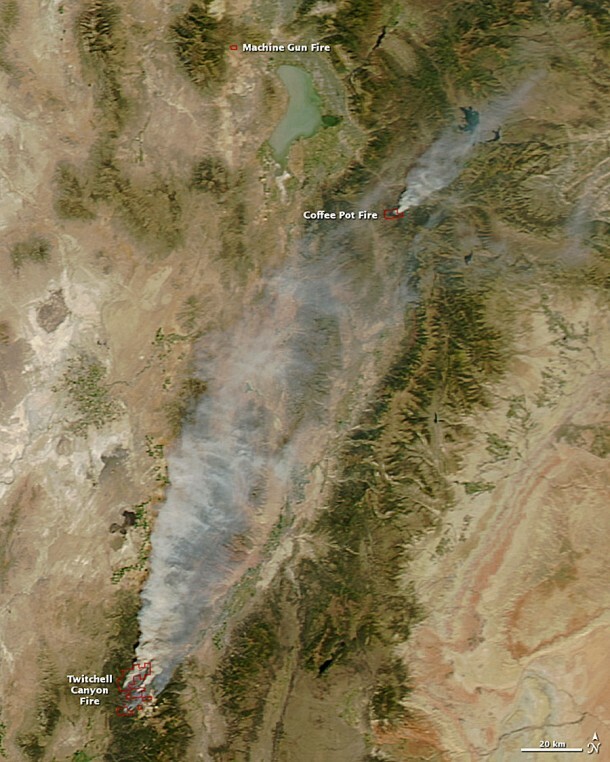 Blowing from the southwest, the winds were pulling thick plumes of smoke north in the midafternoon when the Moderate Resolution Imaging Spectroradiometer (MODIS) on NASA’s Aqua satellite acquired this photo-like image. The fires are outlined in red. The largest of the fires, the Twitchell Canyon Fire, burned through conifer and juniper forest in the remote mountains of central Utah. Though the fire closed a number of roads, including Interstate 70, which runs across the top edge of the fire, it posed no direct threat to populated regions. Lightning ignited the fire on July 20, and by September 19, it had burned about 30,000 acres, said the National Forest Service. The second large fire, the Coffee Pot Fire, was burning in Coffee Pot Canyon in the Manti-La Sal National Forest. It also started because of a lightning strike on July 17. It has been permitted to burn to improve wildlife habitat and reduce hazardous fuels, said the Forest Service on September 13. The Machine Gun Fire is small in this image, but it posed the greatest threat because it burned near the city of Herriman. Amunition ignited the fire during a National Guard exercise on September 19, and strong winds re-ignited it later in the day. Though the fire was small at 3:05, when Aqua MODIS acquired the image, it flared overnight, destroying at least four homes and forcing about 1,500 families to evacuate, reported CNN. The National Weather Service had issued a red flag warning for much of Utah on September 19 and 20, 2010. A red flag warning is issued when extremely low humidity and strong winds create hazardous fire conditions.